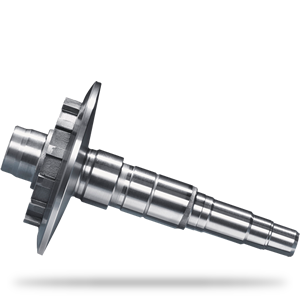 In this application, the surface layer hardening of input shafts, the manufacturer focused on maximum productivity and quality. For the shafts, two MIND 750 hardening machines are used in a so-called I-arrangement, where the machining area is situated between the two machines. The surface layer hardening takes place in the form of progressive hardening, during which four input shafts can be hardened simultaneously. For this, each MIND 750 hardening machine is equipped with two inductors, for a total of four heating at the same time. Each of the four inductors is supplied by its own generator. The benefits for surface layer hardening are obvious: on the one hand, the amount of energy used for each workpiece can be controlled individually, which ensures optimal heating times and the best possible quality when using surface layer hardening. One the other hand, it is possible to fully document the hardening process, which makes quality management easier. The second film shows the induction hardening of a transmission shaft using progressive hardening and stationary hardening. The induction hardening process is carried out on an eldec MIND 750 induction hardening system which in this case has been configured for induction hardening a large number of components. The process uses a dual frequency generator which covers a wide range of applications. The index disc shown in the film can be removed, allowing a shaft to be clamped on a central support. For induction hardening the shafts the index disc was fitted with a shaft transport system to guarantee a secure clamping position for the induction hardening process. The eldec MIND 750 induction hardening system shows its strength impressively here and offers a whole series of methods for induction hardening a very wide range of components.